I went to the store with Isaak. As we were leaving I said, "Hummm I wonder where we parked? I think it was over that way." Isaak said, "All we have to do is look for a blue car with bird poop on it." I had to chuckle. It's so true! 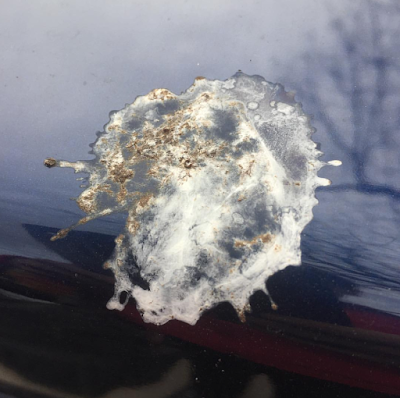 Parking under the neighbor's tree in the driveway makes my car covered in bird poop much of the time. Boo! At the same store we went to Isaak was begging me for Peeps. I've never bought Peeps. I know they are one of those things that you either love them, or hate them. Readers do you love Peeps, or hate them? Isaak apparently loves them. I don't love, or hate them. I'm kind of a middle man with Peeps. I did tell Isaak that they are fun to put in the microwave, to watch them grow. Isaak was all excited. I told him that I wouldn't get them, then turned around without him and got them. He can't have jelly beans because of his spacer retainer, so Peeps it is. Hopefully their stickiness won't be a no no. Ekkk...I didn't think about that until now. We have a student that doesn't shower, brush his teeth, and wears the same clothes over and over again. After listening to his roommates complain, and now I can smell him I turned him in to the Education Director to talk to. I should mention that his grades are suffering, he sleeps in class, and his attendance is poor. Go to find out he's addicted to playing games. I've never met someone with that bad of an addiction before. Well I have 2 classes pretty much ready for the fall. I've been plowing through, since I don't know what will happen with my surgery. Boss man had the same surgery I'm about to have. When I told him I'd be out for two weeks his mouth just about dropped. He said, "I was only out a day or 2." Then a student that had it done said he was out for a month. Boss man must of been so stoned on pain meds that he doesn't remember how long he was out. He needs to break down, and understand that my problems are worse than his were. Each doctor keeps telling me that I'm a special case. We used to have kid (about 15/16) come into the bookstore where I worked. He would sit for hours and read and he smelled terrible. Thinking back now, I wonder if he was homeless? Jason had his surgery last week. Thankfully, it was an easy fix. He only bled heavily for 2 days, then he went back to work. My fitness instructor had to have both sides of her nose broke, so it did take her 4 weeks to recover. Each case is definitely different! My first thought was maybe he's homeless, until you said 'roommates.' I could be wrong but I think an addiction to video games would be a lot easier to break than one might think. Simply throw away the controllers, lol. :) Of course, he'll have to want to... maybe he should go to school to be a game programmer. Good luck w/your surgery. I hope your recovery time is speedy, but I wouldn't rush it, no matter what your boss says. Like you noted, each case is different!! I can't believe a kid is so addicted to video games that he is willing to let his hygiene go like that. Eek! In addition to being addicted to game playing, I wonder if he might be depressed?